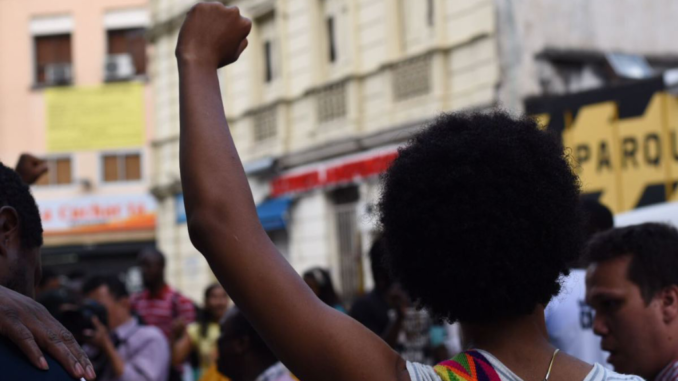 Over 22 days in May and June this year, the Afro-Colombian city of Buenaventura went on a general strike. Residents of the city surrounding Colombia’s main Pacific port had previously mobilized in 2014, against the soaring levels of violence, neglect, and privatization they had suffered since the 1990s. 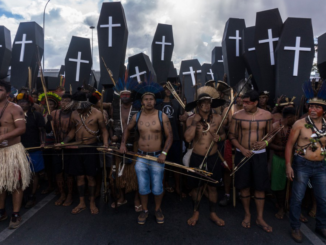 But despite government promises to provide basic infrastructure like sewage and potable water systems, the “social, economic, and ecological emergency” continued unabated until Buenaventura took to the streets. 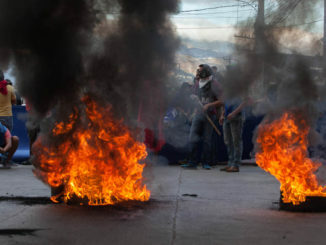 After three weeks of mass marches, roadblocks, and bloody clashes with militarized riot police, an agreement to end the strike was reached. Juliana Vélez Echeverri spoke to Isaías Cifuentes, a social and political activist and member of the Students and Graduates of the National Service of Learning Committee (COES) about how the general strike was born and how Buenaventura sustained it. The conversation has been translated, and edited for length. JULIANA.— What were the strike’s specific demands? ISAIAS.— At first we were demanding that the national government declare a social, economic, and ecological emergency. In economic terms we wanted the reactivation of productive sectors such as fishing, which at one time employed more than 100,000 people in our territory. We also wanted a sewage system, an aqueduct, high- and medium-level hospitals, and a higher quantity and quality of housing. [As a result of the agreement with the national government] there will be a 1.5 billion Colombian peso Autonomous Fund for Buenaventura to begin the first phase of the sewer-system master plan. In this context we will determine where the money will go, and form a 10-year development plan to solve all these problems. The idea is to start with solving the urban and rural aqueduct problem, solving health care through the creation of a hospital complex, the first phase of the sewer system master plan, and the construction of 40,000 houses. Then 1.5 billion Colombian pesos will serve to boost the fishing industry and reduce the unemployment rate. JULIANA.— There were 114 organizations that were members of the civil strike committee. What kinds of groups were involved? ISAIAS.— There were many community organizations. One of the strongest is the Proceso de Comunidades Negras (Black Communities’ Action), an organization that has been in Buenaventura for many years and is recognized at the regional and international levels. It has been focused on ethnic struggle, struggle for territory, and the claims of Afro, Black, Raizal, and Palenquero people. Another organization is the Diocese of Buenaventura; the Catholic Church has not only made our problems visible but also participated directly in the street mobilizations and participated in the negotiation spaces with the national government. Then there are student organizations, such as COES, to which I belong; artistic and cultural groups such as the Pro & Paz and Tura Hip Hop foundations, the Rostro Urbano Foundation, made up of young people and concerned with reconstructing the fabric of our society. There are also unions of public-service workers, workers in the port sector, and teachers. Finally, neighborhood groups and Communal Action Boards1participated. JULIANA.— There’s a long history of struggle in Buenaventura—how would you tell that story to an audience who isn’t familiar with it? ISAIAS.— I think that the social catastrophe we are living in Buenaventura started in 1990—with the opening of Colombia’s economy. I was part of the generation that lived through the deepening of poverty and violence. The armed conflict intensified in our territory after 1998 with the arrival of the paramilitaries. They dismembered 2 whole families, stole our lands, displaced people from one neighborhood to another, one comuna3 to another, or one city to another. They threatened men who had long hair or wore earrings; nonnormative sexuality was an object of repression. The port companies used increasingly sophisticated technology and built more road infrastructure to transport containers. These projects were prioritized ahead of the lives of people in Buenaventura, where poverty is at approximately 80 percent and unemployment is at 64 percent. There is no drinkable water, there is a critical housing shortage, and there is no medium- or high-level public hospital. These realities present a stark contrast with the projects that are developed in our territory for wealthy companies, especially those related to port activity. JULIANA.— So do you think the arrival of violent armed groups in Buenaventura favored the expansion of port activity? ISAIAS.— Of course! There is a report from the Center for Historic Memory titled Buenaventura: un puerto sin comunidad (Buenaventura: a port without a community) that explains how the rise of armed groups and the big port-expansion projects happened at the same time. Territorial control is related to the control of drug-trafficking routes. 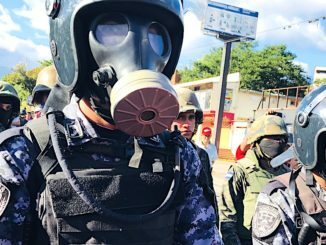 Buenaventura’s location on the Pacific coast of Colombia opens the doors to the global economy, but it is also a strategic territory for drug traffic. JULIANA.— The port of Buenaventura used to be public, but in the nineties it was privatized. Do you think that before the privatization, people from Buenaventura were more involved in the activity at the port? ISAIAS.— When the port was public it was no paradise, but the general social and labor conditions were better. There was a larger flow of money [to the community], workers had different working conditions, they had access to a pension, in general families had a better quality of life. Higher education was more accessible; most of the professionals we have now went to university during the period when the company was public. When the port was privatized, many workers were fired, and they were rehired by contractors. This was illegal, because people should be hired directly and have job stability. The privatization of Colombian ports generated serious poverty and violence in our communities. It is clear that the state has historically been racist, and has racist public servants in its institutions. JULIANA.— How would you describe the presence or absence of the Colombian state in Buenaventura? Not just in terms of labor outsourcing but also in terms of the lack of public services and access to security, health, water, etc. . . .
ISAIAS.— The national government transfers money to Buenaventura to finance health, education and basic sanitation—these transfers should be audited by a separate national entity. But resources sent to Buenaventura have not been invested. In 2011, more than 10 billion Colombian pesos were set aside to build aqueduct infrastructure, but the aqueduct remains obsolete. Where is the justice? Where are the entities that make sure the money is spent on the projects it was set aside to fund? The Colombian state has abandoned Buenaventura, but we cannot forget another statistic—that 90 percent of the population in Buenaventura is Afro-descendant. We ask: Why is this population neglected by the Colombian state? The answer is structural racism. It’s outrageous that we have more than 11 watersheds and yet there is no drinkable water in our homes. For context, Buenaventura contributes an average of 5.7 billion Colombian pesos per year to the national treasury. Out of the 42 municipalities in the Valle del Cauca area, Buenaventura is the most unequal. On February 9, 2014, we had a massive mobilization to defend our rights, and the national government made 30 promises in response, but they didn’t deliver on most of them, or only completed them halfway. We have a saying: “Un estado a medias es una verdad a medias y eso parece más una mentira que una verdad.” [Roughly: a half state is a half-truth, and a half-truth is less of a truth and more of a lie.”] Buenaventura needs structural solutions, and this failure of the state to keep its promises motivated the civil strike this year. JULIANA.— Can you describe the process of convening the strike? Were there meetings and public debates? ISAIAS.— The idea of a civic strike is not new. Core communities have been discussing the problems of Buenaventura, with the idea that the main instrument of resistance should be a civic strike, since 2013. But many of us did not expect such an overwhelming and determined response from the communities. We never lost faith in our people, who constantly go out to protest and demand access to water, but we did not expect the river of people that overflowed into the streets of the city. The clumsiness of the mayor’s office was a factor: They challenged our communities by saying that the strike would not last more than three days because many people in Buenaventura live on earnings from the informal economy. Indignation grew because on the one hand the government was talking about human rights, and on the other hand they were beating us with sticks in the street. Also, the participation of the Catholic Church in Buenaventura was very important: Its representatives brought to light the casas de pique—where bodies were dismembered—and mass graves. So far, the church has been committed to strengthening the rights of Buenaventura’s population. Isaías Cifuentes, Colombian activist, confronts Minister of the Interior about violent repression of Buenaventura’s civil strike from PASO International on Vimeo. JULIANA.— Did the strike have problems maintaining momentum? If people usually earn money from informal work—like street vending—how did they manage to live for almost three weeks without working? Were there communal kitchens? If so many people were out in the street protesting, who was taking care of the children, the sick, and the old people at home? How did people integrate the strike into their daily lives? ISAIAS.— With or without a civil strike in Buenaventura, many families cannot afford three meals a day. The strike didn’t dramatically change the conditions in which most people live in the city. However, before the strike began, some families in better economic circumstances than the others bought extra food for the coming days. The networks of solidarity present in the communities of Buenaventura were what maintained the strike. Due to the socioeconomic conditions in which we live, people are used to sharing food; when you do not have enough to eat, you can go to your relatives and friends, who give you a plate of food, and that’s what we have always done. This solidarity is what has maintained our strength in the face of the state’s neglect. The strike generated very harsh conditions, even for me, but not eating three times a day is not so devastating when the community is so indignant. JULIANA.— What is the relationship between the strike and other Afro-Colombian struggles in the country, in the past and the present? ISAIAS.— During the civic strike, Black people were fighting not only in Buenaventura but also in Chocó and Cali. It is clear that the state has historically been racist, and has racist public servants in its institutions. The struggle of the black people of the Pacific coast—Buenaventura, Chocó, and Tumaco—has been very important, and has made visible the historical problems that we have faced as a people. The government has learned that there are real people in these territories who eat; who need water, housing, work, health; who have a culture of our own, a way of understanding things and living things. The indigenous communities in Buenaventura also participated in the strike, and this has been an important link between peoples in the face of violent and brutal attacks from the national government. JULIANA.— In the context of the agreement, what are your hopes and expectations for what comes next? ISAIAS.— My expectations of the people are positive; in relation to the government, I am pessimistic. We expect the government to comply, in spite of what they demonstrated during the civic strike—that trucks are more important to them than the people of Buenaventura. In the early hours of the morning, ESMAD [riot police] were sent with tear gas and bullets to force people to move from various places where they had peacefully assembled, in order for 20 or 30 trucks to pass. It is important for us to be able to guarantee that the projects are implemented, and that resources are directed toward real solutions to the problems we have. We continue to meet every eight days in the assemblies, and we have an executive committee that represents us before the national government. But we are also going to go out to the streets and neighborhoods of Buenaventura so that people continue to defend what has been agreed with the government. 1. Organizations that were created by a law to facilitate the relationship between communities and the state. 2. Dismemberment here also refers to a specific type of violence used by paramilitary groups—people were dismembered and the body parts were buried in different locations to hide evidence. 3. Colombian cities are made up of comunas, with several neighborhoods per comuna.